Last week, we attended Crossref LIVE18 with this year’s theme being How good is your metadata? In preparation for the conference, we put together a poster outlining our metadata workflow and how we plan to continually adapt in the ever-changing world of scholarly metadata. Download the poster here (PDF) or continue reading to learn more about how we work with metadata. 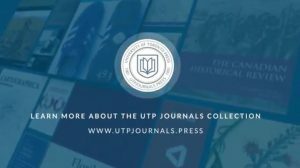 Keep checking Crossref LIVE18 for recorded sessions of this year’s conference and see our author resources if you’d like to learn more about publishing with UTP Journals.